When you’re on holiday in Thailand you may be lucky enough to see some Thai dancing. It’s always so beautiful with exotic costumes and I love it. It’s also a big part of Thai culture and a much effort has been made to keep it alive. In this blog, we’ll give you a background to Thai Classical Dancing and the different kinds of dances you can see. What is the difference between Thai Classical Dance and Thai Folk Dance? Until the 20th Century Thai Classical Dance was only permitted to be performed in the Royal Court but now thankfully it is open to everyone. Thai dancing is either a folk dance or a classical dance, however, there are one or two that falls in between the two genres. Folk dance is a more relaxed dance, with less elaborate costumes. There are dozens of styles of Thai folk dance and Wikipedia does an excellent job of listing them. However, if you are at a resort or at a large show, it is more likely you are watching the Royal Classical Thai Dance style which will showcase dancers in beautiful gold jewellery and headdresses. 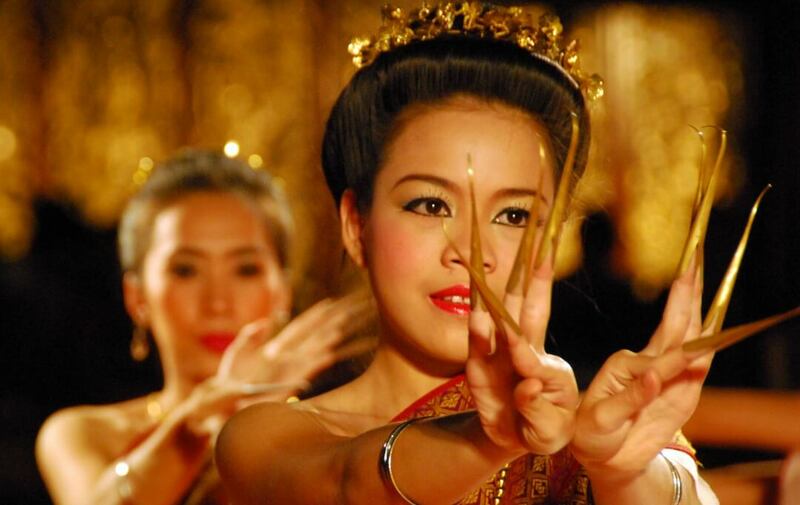 Thai Classical dance dates back more than 500 hundred years when the area of present-day Thailand, Cambodia and Laos was ruled by various kingdoms. One of the most notable was the Kingdom of Siam. With little tradition of spoken theatre, dance was the main dramatic art form in the whole area. Classical dancers were coveted members of the royal courts and treated with prestige. Their costumes were extravagant and unbelievably expensive. Performances interpreted the folk stories and religious epics of that era, mainly the Thai version of the Indian Ramayana. If you attend a show with lots of performers, some of which are dressed as monkeys, you’re watching the highest art form of Thai Classical dance, Kohn. Each performance involves many Thai artists including narrators, performers, dancers, musicians, mask-makers, embroiderers and makeup artists. A huge amount of effort has been made to keep the style authentic and alive. While the uber-traditional Kohn included only male dancers in masks, the style has adapted and there are different types of authentic Kohn around. Traditional Kohn is performed by dancers who mime/dance while the story is being sung or narrated by a chorus. Khon characters include demons, monkeys, humans, nymphs, and gods. One of the classic roles for male dancers is that of the mischievous Hanuman, the Monkey General who comes to the aid of hero of the tale. Lakhon is less formal than Khon and the dancers do not wear masks. Dancers are usually female and perform as a group rather than representing individual characters. Lakhon plots feature a wider range of stories drawn from the Ramakien, (the Thai Ramayana) the Jatakas and other folk stories. Here’s some great information about the varieties of Lakhon and the history too. Another type of Thai Dance, which is part classical/part folk is called ‘Fawn Thai’. This is the most frequently performed dance for tourists because it is more of a small showcase and less of an opera style event. There are 5 types of Fawn dances and my favourite is the fingernail dance. Apparently, there’s no story behind these beautiful gold fingernail extensions, they are just worn for their beauty. The costumes are spectacular and echo past Royal Courts. Manohra is a lovely dance that is unique to the south of Thailand and to the North of Malaysia. It is a dance that tells of the famous Jatakas love story between a Prince and Kinnari Manohra, a half-bird half-woman. They fall in love and marry. While the prince was away at war, corrupt court advisors trick the King into believing that the sacrifice of Manohra will prevent his imminent death and so the story is a tragedy.